Ever dreamed of being the new England boss? Well the top job is up for grabs – and could be yours! But don't envisage a Premier League life-style. This is managing the England lure-fishing squad, not the national footie side. And it will be in a different pay-league to the beautiful game – with the successful candidate probably having to be 'self-funding', rather than picking up a mega-bucks contract. The Angling Trust is looking for a live-wire to lead the Team England Lure squad into the next world championships, set to be held in this country next autumn. And the national body's wish-list includes 'a vision' of that man or woman taking Team England to the world top spot...having 'spotted' the necessary talent along the way. Closing date for applications is November 3. Go to www.anglingtrust.net/vacancies to find out more. WATER temperatures may be falling and the nights drawing in, but some fish are still feeding and Rob Barra landed a 29-2 mirror from Rocla. James Gibbs had Lodge Lake commons of 23lb and 20-2 while Mike Carrol, Roy Cirigliano and Pete Chambers also had 20s with Katie King getting an 18-4. Scott White took his nephew to the Abbeys where the lad had his first three pike AND a 2-2 perch. Den Reid, reporting through GoneFishin, had a 3-6 Dovecote stripy. THE death-toll of canal fish, mostly carp, killed near Church Lock at Leighton last week has topped 800lb. Apparently trapped between lock gates and dredging operations, they are thought to have choked in silt stirred up during the work. 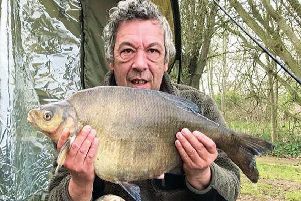 Tenant club Luton AC is demanding to know what, if any, measures were taken to save the fish or move them out of the area before work began, and has submitted questions to Canal River Trust under Freedom of Information Act legislation. TOWCESTER, Furzton: John Balhatchett 14-10, Mick Goodridge 12-1, Brian Beard 10-11. KEVIN Osborne won Newport's Ouse open with 10-15 – roach and dace apart from a 2lb+ chub all on six metre whip. Alan Carr 10-1, Don King 9-6. CALVERT, Itters Pit: Austin Maddock 9-2, Barry Witteridge 6-7, Dave Lewis 6-1. ALDERS open: Lee Newson 129-2, Trevor Price 128-14, Pionochle Archer 124-14. FIXTURES: Sunday, Oct 15 Towcester open (Castlethorpe cut) 01908 563617; also MKAA golden peg match Stony Main 07970 047506; also working party, Abbey Pit 2, 9am; Tues Oct 17 Olney Ouse open 01234 240061.